In the decider T20 match, it will be interesting to see whether Indian side outcast the home side completely and clinch the series 2-1 or the South African side ends the series on a winning note. Virat Kohli-led Team India is looking to end the South African tour on a winning note in the 3rd and final T20 International match against the host. 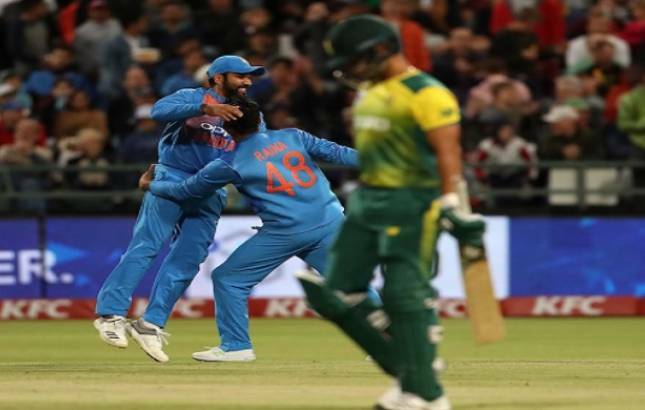 In the second Twenty20 International match at Centurion, South Africa chased down the total of 190 easily and beat India by 6 wickets. Partnership by JP Duminy and Heinrich Klaasen helped the host to claim victory in the match and level series 1-1. # India win by 7 runs, clinhes series 2-1. # With 2 wickets and 11 runs off the over, SA 120/5 aftr 17 overs. # After 16 overs, SA 109/4 Duminy OUT at 55. # After 14 overs, SA 91/3 with Jonker (11) and Duminy(40) at crease. # After 11 overs, SA 58/2 with Duminy(22) and Klaasen(3) at crease. # With 7 runs off the over, SA 52/2 after 10 overs. # After 8 overs, SA 38/1 with Duminy(12) and Miller(18) out in the middle. # Inside edge by Dhoni and FOUR! # Its a SIX! by Pandya. # After 17 overs, IND 136/4 with Dhoni(4) and Pandya(13) at crease. # MS Dhoni comes out to bat. # After 14 overs, IND 117/3 with Pandya(2) and Dhawan(45) at crease. # After 10 overs, IND 81/2 with Dhawan(23) and Pandey(1) at crease. # With 10 runs in the over, IND 75/1 after 9 o9vers with Raina(42) and Dhawan(19) at crease. # After 5 overs, IND 47/1 with Raina(24) and Dhawan(9) out in the middle. # After 3 overs, IND 30/1 with Raina(13) and Dhawan(4) out in the middle. # First ball NOT BALL!